NASA's Curiosity rover has now been exploring the Red Planet for a full Martian year. The $2.5-billion mission, known officially as the Mars Science Laboratory (MSL), has made other important discoveries during its time on the Martian surface, too. 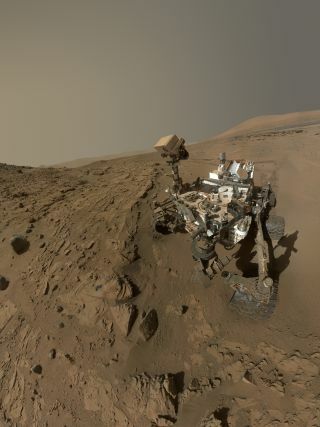 For example, Curiosity's measurements of radiation levels — made during its eight-month cruise through space and while on the planet's surface — suggest that the risk of radiation exposure is not a "showstopper" for manned Mars missions. The rover's data should should help researchers design the shielding astronauts will require on such missions, NASA officials said. Curiosity has also scanned Mars' air for methane, a gas that here on Earth is predominantly produced by living organisms. The rover's instruments have found no traces of the gas, in contrast to some previous observations made by Red Planet orbiters. Curiosity left Yellowknife Bay last July and is now on the way to the base of Mount Sharp, which rises more than 3 miles (5 kilometers) into the sky from the center of Mars' Gale Crater. The huge mountain has long been Curiosity's ultimate science destination; mission scientists want the rover to climb up Mount Sharp's foothills, reading a history of the planet's changing environmental conditions along the way. Unexpected damage to Curiosity's metal wheels has slowed progress toward Mount Sharp a bit, forcing the mission team to rethink and revise its driving plans. The rover has made it about halfway to the mountain's base, with about 2.4 miles (3.9 km) left to cover, NASA officials said. "Over the next few months, the science team is really excited to get to Mount Sharp, where we think the layered rocks there have captured the major climate changes in Mars' history," Curiosity deputy project scientist Ashwin Vasavada said in a new NASA video marking the rover's first Martian year. "We can't wait to get there and figure it all out, but it's going to take a lot of driving."